Since I’ve likened the tone of Book 2 of this series to The Empire Strikes Back, it should come as little surprise that I compare Book 3 to Return of the Jedi. Just as Jedi begins with a mini-adventure that wraps up the loose ends of Empire [rescuing a carbonite-encased Han Solo from the clutches of gangster Jabba the Hutt] before launching into the grand finale against the New Death Star, The Rescue resolves the time-travelling cliffhanger of The Contest before launching into yet another great adventure filled with humor, close calls, a few surprises and dinosaurs in pre-Flood times. Since I refuse to give any spoilers, you’ll simply have to pick up a copy yourself. The cover art gives away a detail which I will happily confirm: the hoverboard we’ve been promised ever since the ill-fated “floating bear” incident in Book 1 finally comes to fruition. Marty McFly would be proud! One of the defining characteristics of this science fiction series [and one of the reasons I so heartily endorse them] is that the authors do not shy away from theological issues; so in addition to dealing with sci-fi questions of how their time travelling adventures might affect the future, we explore a whole host of issues dealing with creation, evolution, apologetics and the Gospel itself through the conversations and character development of our teen heroes. As the back cover promises, “Worldviews will be challenged and lives will be changed.” This promise is just as true for the reader as it is for the characters in the books. Pick up a copy of The Rescue today! 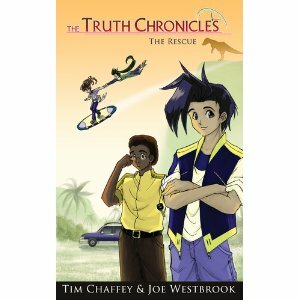 Oh, and be sure to Like the Truth Chronicles Facebook page.